Acidic and harsh, the music of TERRORFAKT is unavoidable. The fast paced and heavy beats bite at the eardrums and reverberate through the body, blurring one's vision and rapidly transporting their being to the pandemonium of a rave, complete with flashing colored lights. After releasing several albums on their own following We Know Pain, TERRORFAKT was signed to Tinman Records and released the album Deconstruction in 2003. The album was a huge club hit in the United States as well as in Canada and the band attributed this success to the loyal DJs who enjoyed the album and played select songs from Deconstruction over the airwaves. In order to build up a strong fan base, TERRORFAKT has been touring relentlessly, performing over 150 times in the U.S. and Canada since mid 2002. The band has opened for such bands as E-Craft, Das Ich, Funker Vogt, Manufactura, Inertia, Haujobb and Hocico. The band's success has enabled them to remix material for numerous bands including P.A.L., E-Craft, NeikkaRPM, Crocodile Shop, Das Ich, Poitive Complex, Wumpscut, Dubok, Massiv In Mensch, Mindless Faith, UV, DYM, Inertia, and GASR to name a few. TERRORFAKT returned with their second release on their new label, Metropolis Records. Released in August of 2004, Cold Steel World contained brutal rhythms designed to turn any dancefloor into a warzone like frenzy. 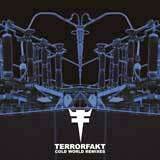 TERRORFAKT's Metropolis debut, Cold Steel World, was one of 2004's greatest sleeper hits. For the first several weeks after the album's release, the label had difficulty keeping it in stock. The band also played over 70 live dates in 2004 alone! 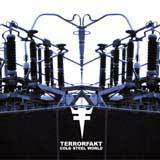 For 2005, TERRORFAKT presented the world with a remix CD packed with over the top remixes and five tracks not on CSW. Cold World Remixes plays smoothly from start to finish like a new studio record thanks to help from the remixing talents of Imperative Reaction, E/Craft, Angel Theory, Cervello Electronico, and Life Cried. This release will tear you up and spit you out. TERRORFAKTs second album on Metropolis, Teethgrinder, was a myriad of torment, anger, confusion, hatred, and pain. Aggressive is too mild of a word to describe the pummeling beats, explosive rhythms, critical state melodies and self-destructive tempo. 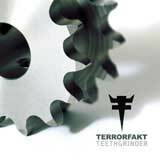 With the most raging album released in 2006, TERRORFAKT reached unprecedented levels with the seething Teethgrinder. For 2009, TERRORFAKT presents: Re/Evolution. A looking forward /looking back type of release in the respect that it features some classic out of print TERRORFAKT material remastered, in addition to a few songs that were never "officially" released, as well as some new remixes and some new studio material. 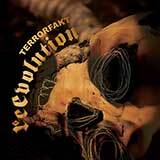 While this may satiate the longing for a new studio album, Re/Evolution can stand on its own as one of TERRORFAKTs best releases.